The posting of this swap has taken forever because every time I look at all of the gorgeous items I feel the need to put practically every product on my face! Mags did an AMAZING job in getting me basically everything I'd get myself! 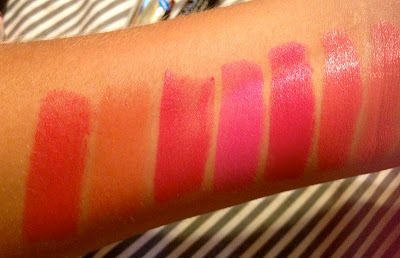 I did ask for a few specific items, but mostly told her what I liked (Lipstick, Blush and corals, corals and pinks;-)! -well, makeup!) 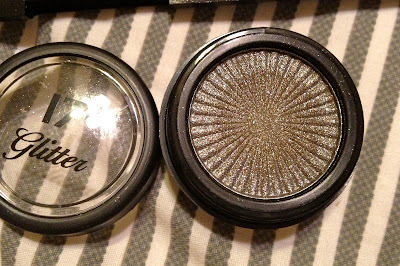 and that I was eager to try Sleek, MUA and Barry M. Mags did not disappoint!!! When The post man walked up my driveway I ran out in my jammies, I was excited, he smiled and said, wow, must be some good stuff!, I thought to myself-you have no idea-Make up from abroad-!! The swap started, as I mentioned with a Kate Moss Rimmel Schiap dupe, #20-which is gorgeous, she also kindly send the beautiful coral #16. I mentioned to Mags but these Rimmel lipsticks smell good! The American Rimmel lipsticks smell don't appeal to me, at all. I've heard people describe them as sugary sunscreen-I love their lipsticks but the smell put me off. The ones Mags sent smell divine-again I cannot describe it except to say I'd like to eat them. 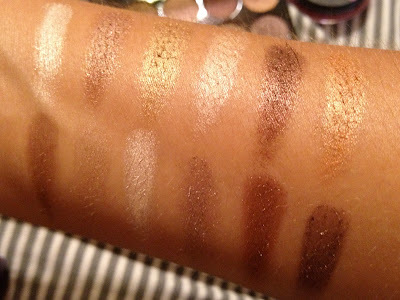 top row/top on arm, L to R. The pigmentation of these are wonderful! Have used this palette several times without a primer and even in this bloody 102-108 degree weather looks decent! 17 Glitter eyeshadow (didn't write the name down and it's at home-D'oh!) Gorgeous color! 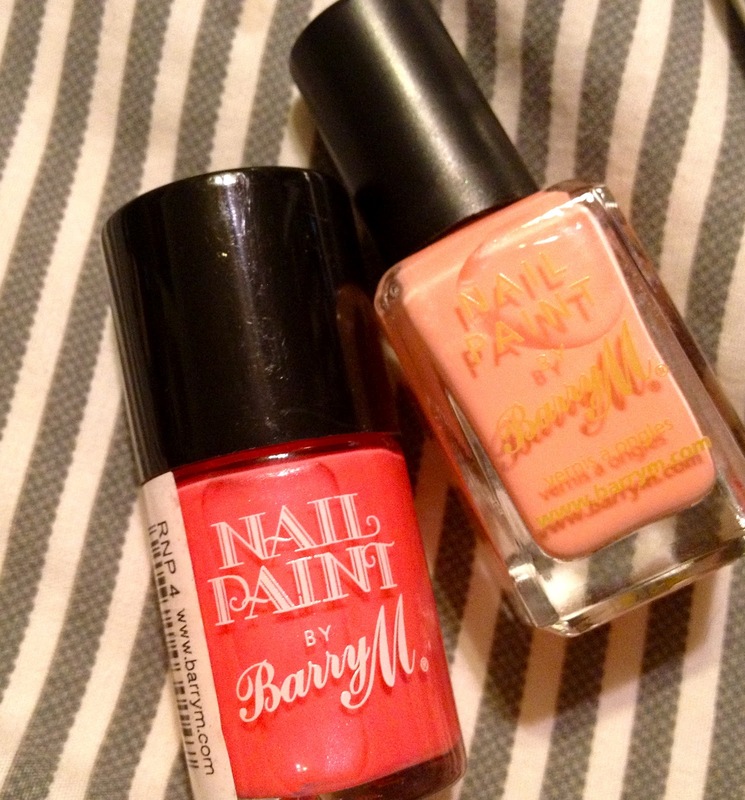 Nail Paint By Barry M (No color listed but its a gorgeous Vibrant coral frost, and (Finally) Barry M Peach Melba!! I have literally had this on my wish list for ever!! I LOVE them both!! A Beautiful Marilyn Monroe card (Mag is a huge Marilyn fan! 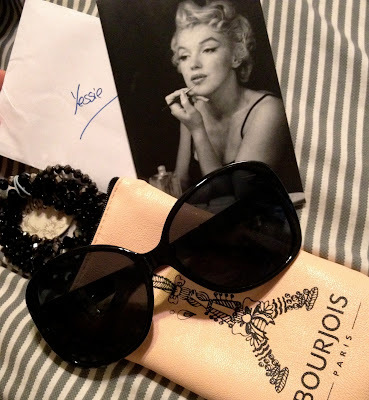 ), free Bourjois glasses that she kindly included as they were a free gift with purchase. Have worn them everyday. And the beautiful beaded bracelets. I have to say I was SOOOOO happy with my swap with Mags, I can honestly say besides getting all these wonderful, and amazing products I've also made a new friend. I think Mags can attest to that. I probably tweet her about 20 times a day. Just like old chums do! If you get the chance to swap, I cannot recommend it enough. Mags and I are swap buddies for life (Like Ted and John in TED the movie)hehe. it was an amazing package indeed!!! 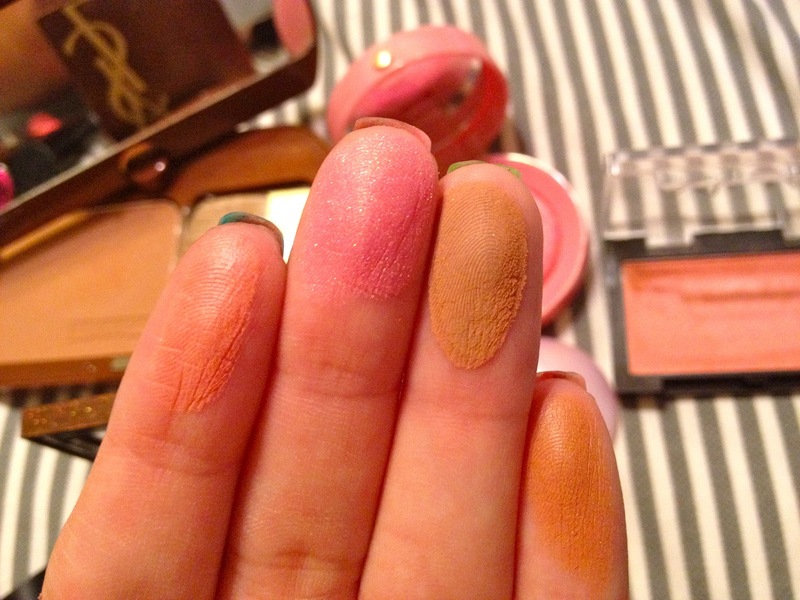 I love that Palette. Love. 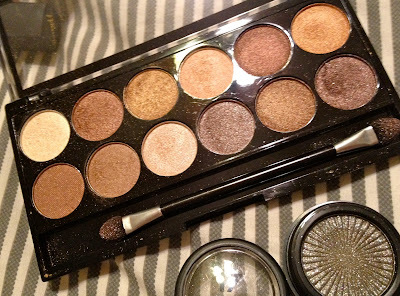 I'm loving it all-it almost to pretty to use-but I can't help myself!! wow wow. u got really good stuff! hope you like them! nothing excites me more about swapping with overseas beauty buddies! I got extremely lucky! I loved every single item I got! Me too love seeing swap posts! Its an excellent way to meet fellow beauty lovers all over the world! Wow so many great products...love all the MUA lipsticks and Heaven & Earth palette...cute sunglasses too!! Great swap!! I am beyond happy and it's hard to use anything - since I can't just go and pick up some more! Those are my new fave sunglasses! WOW! I can understand your excitment, deliveries don't come much better than that. A great selection! I love sleek, 17 and Barry M. You'll have to let me know when you're ready to do another and how it all works. I feel like its Christmas everyday with all that stuff! I love all the knees you mentioned- I know have more Barry M to add to my collection (thanks to you!) and am loving all the 17 products! I've been picking up a few pieces for you here and there but will def let you know! I'm still awe from all the beauties I got sent=) Yes, luckily she also didn't have a problem with customs-whew! Wow that's a great swap :) Your super lucky!